So I had been eye balling this product for a minute. I was blabbing on one of the many hairboards I'm a member of, LHCF, about how this was on my wish list. A kind member PM'd me and said she had 2 that she was looking to get rid of for $9 each, shipping included. That's a good deal seeing as how it's like $9 excluding shipping on the site. So I only bought one off of her b/c I didn't know if I would like it or not. I'm liking this product. It smells heavenly; like a strawberry vanilla milkshake. It's like you'll want to eat it. As from my mini twists post, I used it to twist my hair and really like it for that. 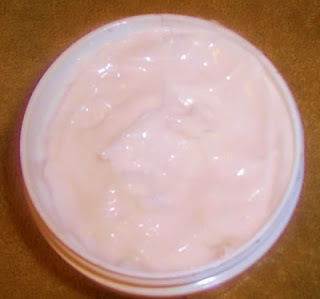 It is moisturizing, gave just the right amount of hold without making the twists feel crunchy, wasn't too heavy on my hair, and made my hair smell like a sweet treat. Nice. So it gets an A+ for twisting with. Any looking for a twisting product may want to try this. It also good for smoothing out and slicking back your hurr. LOL. But I won't use it for that really cuz that's what my aloe vera gel is for. It doesn't give much hold that is usually desired for shingling and finger styling hairstyles. So unless your goal is for minimal hold, you may not want to use it with these styling techniques in mind. All in all, it's a good product, smells heavenly and the ingredients are all natural. Ingredients: Aloe Barbadensis Leaf Juice, Coconut oil, Glycerin, Avocado oil, Essential oil blend. I LOVE the ingredients list. I might have to try this for the summer. I make 99% of my products. I am so not a product junkie, but this sounds like a good find. Thanks for sharing. Svrbrownsuga: It is an awesome product. Didn't mean to start up your PJ'ism! LOL. Makeup Theory: I know, aren't the ingredients bomb? Hey Amina. As far as the scent goes, I do not think it's over powering but as we know, this really depends on the individual. I hope you like it. If not, I'll gladly take it off your hands. ;o) LOL.